The S&P 500 (^GSPC) fell 0.29%, or 8.34 points, as of market close, led by declines in the financials sector. The Dow (^DJI) declined 0.55%, or 141.71 points, with Goldman Sachs (GS) and JPMorgan Chase (JPM) among the laggards in the 30-stock index. The Dow had been up as many as 204 points initially following the release of the Fed’s policy statement. The Nasdaq (^IXIC) edged up 0.07%, or 5.02 points. The Federal Open Market Committee on Wednesday said it will hold benchmark interest rates unchanged at between 2.25% to 2.5%, marking the second straight pause on rate increases. This decision been widely expected by market participants. The Fed’s latest dot plot, a chart showing each of the FOMC members’ target interest rates for the near- and long-term, pointed to a median of zero rate hikes in 2019. This is lower than the two rate increases in 2019 suggested in the December dot plot, the last time the projections were released. Central bank officials telegraphed that “economic activity has slowed from its solid rate in the fourth quarter” and highlighted sluggishness in household spending and business fixed investment in the first quarter. Underlying inflation has remained near the Fed’s 2% target, the statement noted. The FOMC also said in a separate statement that it expects to “conclude the reduction of its aggregate securities holdings in the System Open Market Account (SOMA) at the end of September 2019,” referring to its balance sheet normalization process. The Fed is currently allowing a combined $50 billion in Treasurys and mortgage-backed securities to roll off its balance sheet per month. It now expects to reduce redemptions for Treasurys to $15 billion starting in May, from $30 billion currently. “The average level of reserves after the FOMC has concluded the reduction of its aggregate securities holdings at the end of September will likely still be somewhat above the level of reserves necessary to efficiently and effectively implement monetary policy,” the Federal Reserve said in its release. Ahead of the release of the Fed’s policy statement, investors were looking for a timeline for the Fed to end or slow the roll-off long-term Treasurys and mortgage-backed securities it has carried on its balance sheet, which have been there since the end of the financial crisis. This has been a key concern of investors who fear the shrinkage would hurt market liquidity. However, the Fed said after its January meeting that it would be “prepared to adjust any of the details for completing balance sheet normalization in light of economic and financial developments.” These comments had helped send stocks higher following the Fed’s last meeting. Treasury yields sank following the release of the Fed’s latest policy statement. The yield on the 10-year note, which moves inversely to the price, fell about 8 basis points to 2.53%, or the lowest level since January 2018, while the yield on the 2-year note slid to 2.38% Wednesday afternoon. FedEx has also been in focus after the courier company cited sluggish global growth as cause for its disappointing third-quarter revenue and second annual profit reduction in three months. Shares fell about 3.5% as of market close. FedEx, which reported results after market close on Tuesday, said it sees full-year adjusted earnings of between $15.10 and $15.90, short of the $16.03 estimated by consensus economists. FedEx’s third-quarter adjusted earnings also missed consensus estimates by 9 cents, and quarterly revenue of $17 billion slightly undershot the $17.66 billion expected. “Slowing international macroeconomic conditions and weaker global trade growth trends continue,” FedEx CFO Alan Graf said on a call with investors Tuesday. 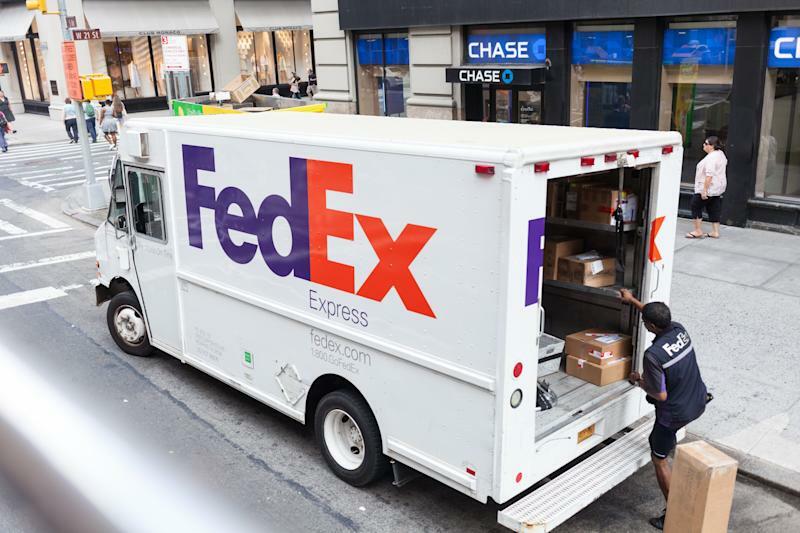 New York City, NY, USA - July 7, 2015: FedEx Express truck in midtown Manhattan. FedEx is one of the leading package delivery services offering many different delivery options. Meanwhile, the Japanese government lowered its view on the economy for the first time in 3 years, blaming the U.S.-China trade war for weak exports and industrial output. Elsewhere, UK prime minister Theresa May has sent a letter to European Council President Donald Tusk that requested a Brexit extension, after British lawmakers last week voted to extend the departure past the original March 29 deadline and avoid a no-deal departure. In the letter, May requested an extension to the Brexit process through June 30, and said she would bring back her deal for another vote in Parliament. The British pound dipped against the U.S. dollar (GBPUSD=X) to about $1.31 following the release of the text of the letter. General Mills (GIS) reported better-than-expected net sales, adjusted earnings and gross margin for the third quarter and raised its guidance for full-year adjusted profit, sending shares higher in early trading. The packaged foods company posted third-quarter adjusted earnings of 83 cents on net sales of $4.2 billion, ahead of expectations of 69 cents and $4.19 billion. Gross margin of 34.2% was 130 basis points ahead of expectations. General Mills said it expects fiscal 2019 adjusted EPS in the range of flat to up 1% from the $3.11 it earned in fiscal 2018, versus the flat to down 3% range it provided previously. Alphabet-owned Google (GOOG, GOOGL) was fined 1.5 billion euros ($1.7 billion) by the European Commission for antitrust violations in its online advertising practices. The commission, which has now hit the tech giant with about 8.25 billion euros-worth of fines over three major cases since 2017, said Google stopped website publishers from placing advertisers from competitors on its search pages.